Not much further than an overnight train ride from the Indonesian capital Jakarta, the historic Central Java, Indonesia city of Yogyakarta serves as a repository for Javanese high culture and history. The activities in this list only scratch the surface of the things you can do when visiting Yogyakarta; read up and put this historic Indonesian city firmly at the center of your next Indonesia itinerary. The ruling monarch of Yogyakarta, Sultan Hamengkubuwono X, reigns from a palace, or Kraton, located in the middle of the city (Google Maps). The Kraton serves as a religious and cultural center for the locals: religious processions wind through the Kraton to the nearby Masjid Gede Kauman on special feast days, open-air festivals are held on the Alun-Alun Utara field next to the palace, and daily cultural performances are conducted at the Bangsal Sri Manganti within the Kraton. The "Palace" may not be as grand as the royal residences you'll find in Thailand or in Europe, but the buildings are rich in symbolism: the tour guide you're required to hire at the gate will prove extremely helpful in untangling the legends and symbols associated with the Sultan and his sprawling residence. The land surrounding Yogyakarta has long been the seat of empire. Traces of the ancient Hindu and Buddhist empires that once ruled Java can still be found nearby, from the jigsaw-puzzle Prambanan Temple to the magnificent Borobudur stupa, some 40 minutes away from Yogyakarta by car. The temples reflect the unique fusion of Indian and indigenous cultural traditions that sustained the Srivijaya, Mataram and Majapahit kingdoms whose rule ebbed and flowed over central Java. Prambanan and Borobudur both date back to the 9th century AD, the products of competing Hindu and Buddhist domains. While in Yogyakarta, visit a few other temples off the beaten path: Ratu Boko, a mysterious palace and temple ruin within sight of Prambanan; Plaosan, a Buddhist complex in Prambanan's Hindu shadow; and the somewhat dangerous Dieng Plateau and its Hindu temples. Yogyakarta's batik industry is rooted in the city's long artisanal history, associated with the presence and blessings of the Sultan. Thus the city's batik makers are located close to the city center, with a number of workshops located south of the Taman Sari. To get a literal hands-on experience of the Yogyakarta batik industry, visit the Yogyakarta Batik Museum (museumbatik.com, location on Google Maps), where you'll see just how difficult the batik-making process can be, from laying lines of hot wax onto the fabric to soaking the fabric into the dye. If you'd rather just buy the finished product, the in-house shop obliges with a collection of batik from all over Indonesia (each region has a special trademark pattern – for example, batik from Cirebon is famous for its cloud-like designs). Jalan Malioboro (Malioboro Street) is Yogyakarta's center for cheap shopping - a whole street lined with stalls selling batiks, silver, and mass-produced souvenirs. 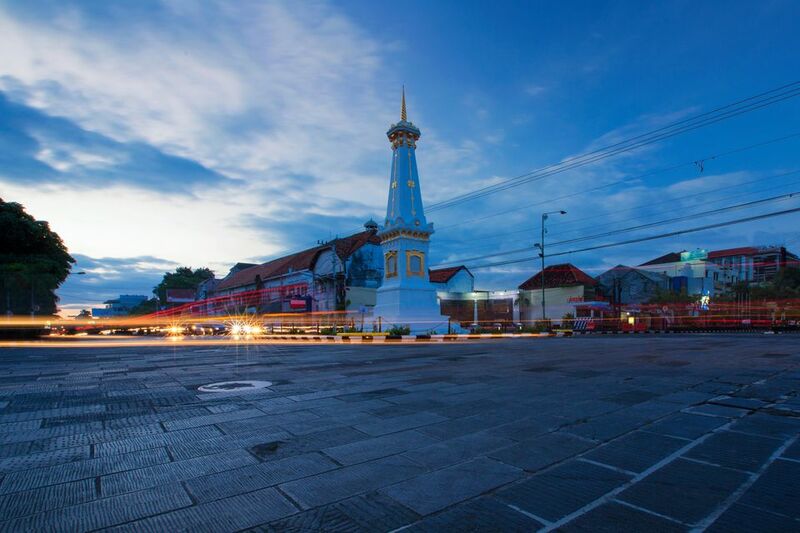 The street is one of Yogyakarta's main thoroughfares – in olden times, Malioboro used to be a ceremonial avenue for the Sultan to parade through on the way to and from the Kraton. The place is still steeped in history, with a number of historic buildings standing along its length: Fort Vredenburg, the State Guest House, and the Central Post Office, all magnificent examples of Dutch colonial architecture. For an afternoon shopping in this district, start at Beringharjo market and proceed down the street to check out each stall's wares. The batiks along Malioboro are particularly worth checking out! As with Yogyakarta's batik trade, the silver industry in the city is linked to its long history of artisanship in the service of the Sultan. To see Jogja's silver artists in action, visit Kota Gede, about two miles southeast of Jalan Malioboro, accessible by bus or becak. The area's main street, Jalan Kemasan, is lined chock-a-block with silver workshops turning out fine filigreed silver craft and jewelry. (Look out for their silver-crafted miniatures, like the silver horse carriage pictured here.) As with the batik shops, some silver shops allow visitors to look at the silver being crafted by artisans, or try one's hand at working the silver themselves. This writer visited Ansor's Silver (ansorsilver.com, location on Google Maps), a two-storey silver shop in a grand Javanese-style building dating back to 1870. After a tour of the gallery and the workshop on the ground floor, guests are taken to Ansor's second floor to try their hands at creating a silver filigree leaf with their own hands! From the Kraton or around Jalan Malioboro, you can hire a becak (rickshaw) to take you around the historic part of town, or just to get from place to place. Becak fare is cheap – about $1 per trip (read about money in Indonesia) – and the ride is a rush, as passengers are positioned in front of the driver, so you are completely exposed to the oncoming traffic. The prices of riding a becak are not fixed, and must be agreed upon before you get on; you'll get the most value out of your becak experience if you haggle the price down. Yogyakarta's most popular cultural spectacle takes place after dark, with the Prambanan Hindu temple as a starkly-lit backdrop. A cultural troupe performs the Javanese version of the Ramayana on an open-air stage, condensing the Hindu epic in a couple of hours for the sake of tourists. For the basic plot of the Ramayana as performed elsewhere in Indonesia, read our article on the kecak dance in Bali. You simply can't leave Yogyakarta without trying gudeg, the royal city's iconic dish: a jackfruit-based savory preparation served hot with rice. To eat gudeg the way Yogyakartans do, visit Sentra Gudeg Wijilan (location on Google Maps), a clump of eateries located east of the Kraton. Gudeg is common to most of Central Java, but Yogyakarta's gudeg is different – it derives a reddish flavor from the addition of teak leaves. You'll also be served with side dishes to go with your gudeg meal: tempeh (fried, fermented soybean), sambal krecek (beefskin stew), and eggs go down well with this Yogyakarta staple. For a more upscale experience, you can eat a Sultan's spread at Bale Raos (baleraos.co.id, location on Google Maps), whose menu recreates the meals eaten by Yogyakarta's royal family. Sit at the restaurant's airy pavilion to dine on Javanese barbecued shrimp (udang bakar madu) and chicken stew (semur ayam panji), just like royalty. The Taman Sari (location on Google Maps) is a "water palace", a swimming and bathing complex built exclusively for the royal family's use. In the days when the Sultan had a harem of his own, the Taman Sari was where he could take his pick of the ladies. Today, only the central bathing complex is in decent repair. You can walk around the now-dry pools, where the Sultan's harem may have bathed, and the upper-storey viewing room where the Sultan may have peeked at the bathers. A few minutes' walk northwest from Taman Sari takes you through a cramped local neighborhood, the least likely place to find the torus-shaped underground mosque known as Sumur Gumuling (location on Google Maps). Before the Dutch came knocking, the Royal Family used Sumur Gumuling as a place of worship. After the Yogyakartan Prince Diponegoro rebelled against the Dutch in 1825, the colonial authorities deconsecrated Sumur Gumuling, reducing it to a hidden historical curiosity. The center of the mosque opens up to the sky, where a series of Escher-like steps links the two storeys of the mosque (the upper storey was for female worshippers, while male worshippers used the lower storey). Today's royals worship at the Masjid Gede Kauman (location on Google Maps), a grander building north of the Kraton that serves as this kingdom's equivalent of Westminster Abbey. An hour's taxi-drive from Yogyakarta's city center takes you deep into the local countryside, where a Ganjuran Church (location on Google Maps) combines Javanese iconography with a Western faith tradition. Java's empires assimilated Hindu, then Buddhist, then Islamic influences before the coming of the Dutch. In 1924, Dutch planter Julius Schmutzer built a church that then demonstrated that the Javanese talent for syncretism could accommodate even Schmutzer's native Catholicism. The main church building will look familiar to visitors who've seen the Kraton: it bears a Javanese pendopo style roof, with a gamelan orchestra in place of a church organ. Its Jesus and Mary icons look like Javanese royalty. The prayer altar outside the church building looks exactly like a Balinese candi, or house temple – and just as Javanese of other faith traditions do, local Catholics take off their footwear before climbing up the candi to pray. Some 14 miles north of Yogyakarta's city center takes you to an out-of-the-way museum on the slopes of Mount Merapi. Trust us, the trip is worth it: Ullen Sentalu Museum (ullensentalu.com, location on Google Maps) presents the best one-stop look at the Javanese monarchy that you'll ever find. The museum's guide takes visitors through a series of exhibits, many nested in stories about the Yogyakarta royals of old – among them Tineke, the lovelorn daughter of the ruler of Solo; and the great beauty Gusti Nurul, whom former President Sukarno carried a torch for. Visitors also learn about the ways of the court – the meanings of different batik patterns, the significance of the Nyai Loro Kidul myth, and the hidden language of royal uniforms. Most visitors conclude with lunch at the attached Beukenhof Restaurant, which recreates a Dutch colonial villa of the late 19th century.